130 starters, 41 of whom were on sponsored teams and 89 were independent touristes-routiers. 49 finishers. While not the dominant rider he was the year before, Ottavio Bottecchia effectively won the Tour in stage 9 (Luchon-Perpignan). Bottecchia rode an economical Tour, wasting little energy, hugely assisted by future Tour winner Lucien Buysse. Despite his domestique duties, Buysse was second, giving Automoto the podium's two top positions. Alfonso Piccin, Théophile Beeckman, Adelin Benoît, Emile Masson, Sr., Omer Huyse, Bartolomoeo Aymo, etc, s.t. Charles Roux, Léon Despontin, Vincenzo Bianco, Charles Krier, Michele Gordini, Jean Alavoine, Omer Huyse, etc, s.t. Albert Dejonghe, Federico Gay, Arturo Bresciani, Léon Despontin, August Verdyck, etc, s.t. 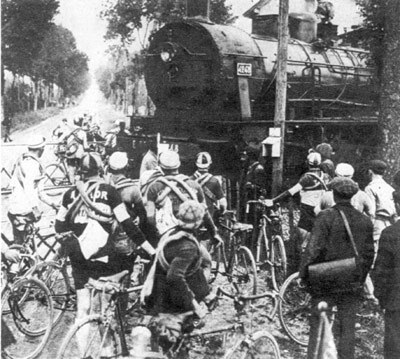 Since 1910, the year of Octave Lapize's victory, the Tour had used a 15-stage format. 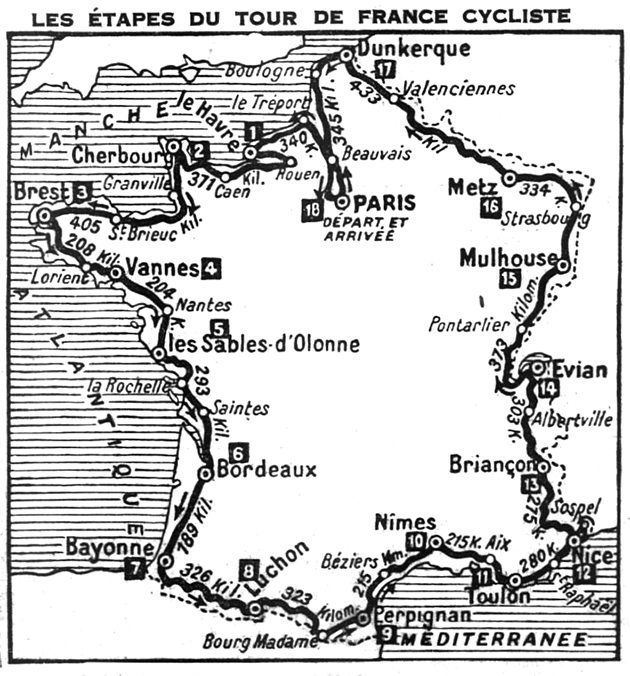 In 1925 the Tour went to 18 stages with roughly the same distance as in 1924, 5,430 kilometers. The average length of a stage in 1924 was 361 kilometers. It dropped to 321 kilometers in 1925. Henri Pélissier was winning one of his most important arguments. 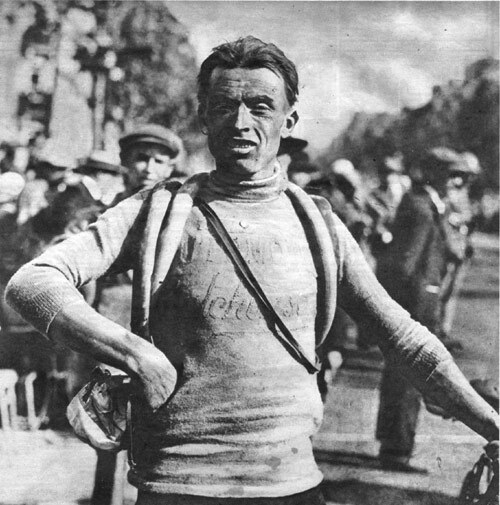 Pélissier believed that the numbingly long stages made for poor racing and fought for shorter stages ridden at higher speeds. In the end, history has validated Pélissier's argument. Desgrange also reduced the time bonus for stage wins. Automoto brought a formidable team to the 1925 Tour. Its 6 men included Ottavio Bottecchia, Philippe Thys, Henri and Francis Pélissier, and Lucien and Jules Buysse. Among them, I count 7 Tour victories past, present and future. Eugène Christophe, wearing the JB Louvet jersey was riding his last Tour. Also riding their last Tours were Jean Alavoine, Philippe Thys, Henri Pélissier and that eternal second, Hector Heusghem. 130 riders departed on Sunday, June 21 from Paris. 340 kilometers later Ottavio Bottecchia came in alone, 2 minutes, 59 seconds ahead of Francis Pélissier. 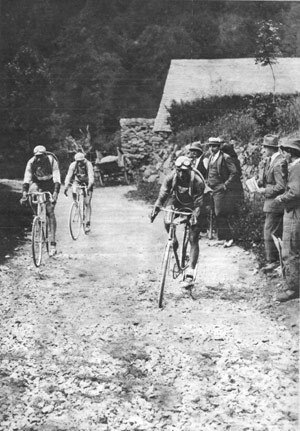 Bottecchia started the 1925 Tour the same way he started the 1924 edition, in Yellow. Bottecchia kept the Yellow Jersey until the end of stage 3 where he lost about 6 minutes to a front group that contained Belgian rider Adelin Benoit. Benoit took over the lead with Bottecchia only 8 seconds behind. Future Tour winner Nicolas Frantz (1927, 1928) was getting better. He won stages 4 and 5 but Benoit kept the Yellow Jersey. Bottecchia shadowed him keeping the gap in the General Classification at 8 seconds. Feed zones have certainly changed. 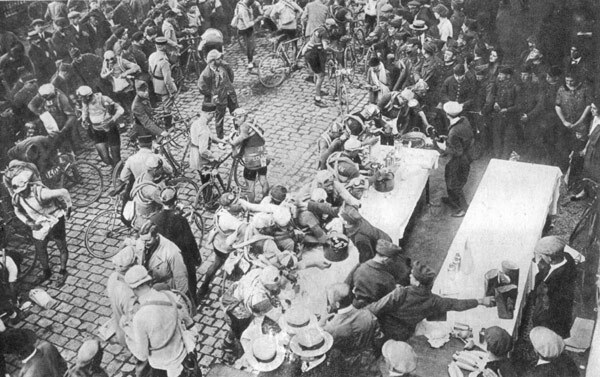 Here, the riders collect food during the 16th stage as they pass through Wissenbourg. Note the bags on the table to the right. Bottecchia won stage 6, still a long 293 kilometers from Les Sables d'Olonne to Bordeaux. The list of riders finishing at the same time with him reads almost like a Who's Who of the early Tour. Frantz was second. Not far behind him were Jean Alavoine, Philippe Thys, Francis Pélissier, Eugène Christophe, Émile Masson, Honoré Barthélémy and Romain Bellenger. In all 43 riders, many of them cycling immortals, galloped for the line that day. Oh, to have seen that finish! Bottecchia remained in second place, at 8 seconds behind Benoit. Stage 7, 189 kilometers from Bordeaux to Bayonne, made a difference. Bottecchia was first in a 6-man lead group that beat the pack by 4 minutes, 30 seconds. Bottecchia took back the Yellow Jersey with Benoit over 4 minutes in arrears. Pelissier, Aimo and Bottechia on the Aubisque. Bottecchia, on the right, must have had a problem, note his left foot is not in the toe clip. The next day, stage 8, was the first of the 2 days in the Pyrenees with the Aubisque, Tourmalet, Aspin and the Peyresourde. Bottecchia was first over Aubisque. Omer Huyse of the Armor team crested the Tourmalet and the Aspin in the lead. But Benoit was on fire. He led over the Peyresourde and came in alone, 9 minutes ahead of Huyse. Bottecchia trailed in almost 12 minutes later. The rest of the field was wrecked. Fourth place that day went to Frantz who was almost 22 minutes behind. Bottecchia's loyal Automoto teammate Lucien Buysse was 44 minutes down and he was only tenth! Hector Heusghem was over 2 hours slower and Philippe Thys was yet another hour behind. Bottecchia was back in second place in the General Classification, almost 7 minutes behind Benoit. Across Southern France, heading for the Alps, Lucien Buysse took care of Bottecchia, acting as a loyal, selfless domestique. In return, Bottecchia let Buysse take the stage wins in both stage 11 to Toulon and stage 12 to Nice. Bartolomeo Aimo leads a very strung-out field over the Allos on a wet, miserable day. Note that the road is unpaved. In the Alps Bottecchia extended his lead without worrying about winning the stages. The Italian sports fans who had flocked to the Tour to see Bottecchia ride had the pleasure of seeing their compatriot Bartolomeo Aimo be the first over both the Vars and the Izoard as he rode to win stage 13. Bottecchia was 10 minutes back but General Classification second place Frantz was over 13 minutes slower. And here's Bottecchia going over the Izoard. Stage 14 took the riders over the 2,556-meter high Galibier and the 1,498-meter Aravis on their way from Briançon to Évian. 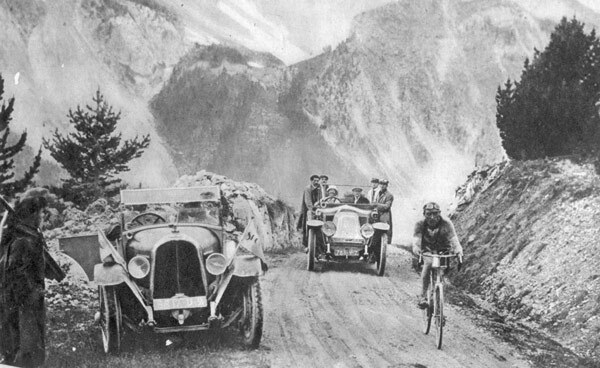 Lucien Buysse led his team captain Bottecchia over the Galibier while Bottecchia took the point over the Aravis. JB Louvet rider Hector Martin won the stage but Bottecchia, Aimo, Buysse and Dejonghe finished with him with the same time. The gap between Aimo and Buysse was quite small. Buysse remedied what he surely thought was a curable deficiency in the standings by breaking away with Frantz, Dejonghe and Hector Martin in the sixteenth stage. Aimo missed the move and finished 5 minutes behind the fast-moving quartet. Buysse advanced to second place and Frantz was now third in the General Classification. For the last stage into Paris Bottecchia got into a break with his 2 teammates, brothers Jules and Lucien Buysse, as well as Aimo and Romain Bellenger. Bottecchia won the sprint, icing a perfectly run Tour. He rode economically and carefully, avoiding needless, energy-wasting display. Both Francis and Henri Pélissier abandoned the 1925 Tour. 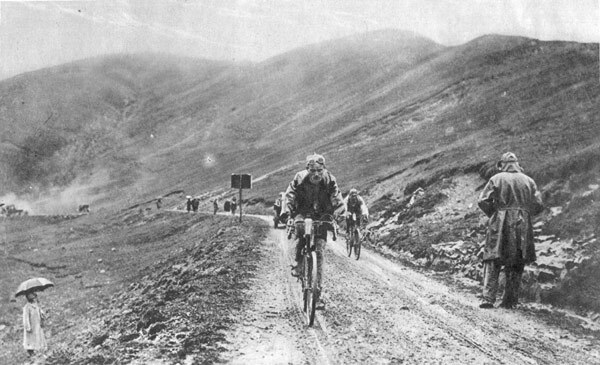 Henri bailed out on stage 4 and Francis quit on stage 9 (the Luchon to Perpignan Pyreneen stage). Philippe Thys quit on stage 9 as well. Riders stopped at a level crossing. It looks like a few got through. The French were shut out of the top 10 in the final General Classification. Alcyon rider Romain Bellenger's 4 hours, 26 minutes behind Bottecchia, eleventh in the General Classification, was the best the French could do. For the first time Italians took 2 of the 3 places on the podium. France would have to wait until 1930 before one of her sons would again wear Yellow in Paris. Since this was the last year Henri Pélissier rode the Tour, let's take a look at his post-Tour life. As we have noted, Henri Pélissier was a hothead, willing to get into an argument any time. One time his public comments describing his fellow racers as draft horses so offended the peloton that at an inopportune moment when he stopped to urinate the angry pack broke its unwritten rule and en masse attacked and permanently dropped him. He wasn't just a man who seemed to be at war with the outside world. His first wife, Léonie, finding life with Henri intolerable, killed herself in 1933. Henri replaced her with a paramour, Camille Tharault. They argued ferociously. 2 years later in 1935 the warring pair had a terrible fight, Pélissier cut Tharault in the face with a knife. In return, Camille shot him dead with the same revolver Léonie had used to commit suicide. She did the job correctly, putting 5 slugs into Pélissier. After pleading self-defense, the court gave her a year's suspended jail sentence. Les Woodland notes that this was as close to an acquittal as the courts could give her.